A 3D printer has notched an important milestone on the way toward its planned launch to the International Space Station next year. An engineering model of California-based startup Made in Space's 3D printer passed a battery of tests at NASA's Marshall Space Flight Center in Huntsville, Ala., confirming that the machine can survive the rigors of launch and function in a microgravity environment, company officials announced Wednesday (Aug. 7). 3D printers use a technique called extrusion additive manufactuing to build objects layer by layer out of composites, polymers, metals and other raw materials. The technology could aid humanity's expansion out into the solar system, NASA officials and other advocates say, by making space travel cheaper and more efficient. Made in Space and NASA Marsall hope to jump-start this vision with their 3D Printing in Zero Gravity experiment (3D Print for short). 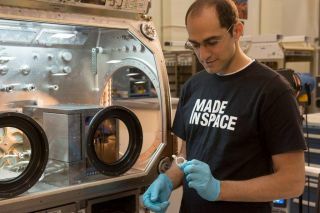 The project aims to launch the first-ever 3D printer to the space station in August 2014, but the machine must clear some hurdles along the way first. Three prototype versions of Made in Space's printer passed a series of microgravity tests several months ago, showing their stuff during parabolic airplane flights. The recent tests at Marshall, performed with the company's Engineering Test Unit (ETU), ensured that the printer can survive the vibrational stresses of launch and deal with electromagnetic interference, among other issues. Data from these tests will inform the critical design review of the flight unit prototype, a big step toward clearing the machine for launch toward the space station. That review process is slated to begin Aug. 15, Made in Space officials said. "The successful results received from the ETU testing at [Marshall] reinforces our confidence that Made in Space, Inc. has developed the robust design required to successfully print in space," Niki Werkheiser, 3D Print project manager in Marshall’s Technology Development and Transfer Office, said in a statement. "We are excited to have successfully completed yet another key step toward meeting the extensive ISS flight certification process."